Ouch, that hurts. I could see a negative move in the works but I don’t think anyone expected a plunge like this past week. Friday upside move was very unimpressive so, although we might get a bounce here, the downside still looks like the direction ahead. Back in 1981 stock market Guru Joseph Granville sent out an urgent Early Warning to his subscribers to SELL, SELL. Markets around the world immediately (within hours) took a severe plunge with the NYSE having its heaviest volume sell-off in history. Fast forward to this week, Dennis Gartman predicted gold would go to $1475 and bang, he is credited (?) with this week’s gold decline (I think I made a similar prediction (?) about 2 ½ months ago). Timing is everything. A look at my long term P&F chart shows the following, based upon action to the Friday close. A long term bear projection to $1400 during the Sept. move through the $1700 mark. Following a failed rally and lower top the P&F gave a more recent prediction to the $1500 level on its move through $1600 a little over a week ago. Unfortunately, a move to $1525 would trigger two more projections, one to the $1150 level and one to the $800 level. So, we have possible projections all over the place. A technician’s dream. Whichever projection is met I can then say I told you so. Of course most readers would have forgotten all the other projections that may not have been met. Stock market memories are a short term thing. Trend: Back to reality. This week’s action has taken gold below its long term moving average line and the line has just turned to the down side. Strength: The long term momentum indicator stopped just short of breaking below its neutral line and finished the week just above the neutral line in its positive zone. It is, however, below its negative sloping trigger line. Volume: The volume indicator has dropped below recent lows and heading lower. It is below its negative sloping trigger line. At the Friday close the long term rating is now BEARISH. The short term moving average line has moved below the long term moving average line for the first time since Dec of 2008. I don’t use this as a confirmation indication but it is significant. I guess one can guess that the intermediate term does not look so good. There seems to be nothing in the indicators to be encouraged about. Trend: Gold is now well below its intermediate term moving average line and the line slope is now well pointed in the downward direction. Strength: The intermediate term momentum indicator has now dropped below its neutral line and is at its lowest level in the negative zone since its highs of a few months back. It is also below its negatively sloping trigger line. Volume: As with the long term the volume indicator is moving ever lower below its negative sloping trigger line. At the Friday close the intermediate term rating is BEARISH. This rating is confirmed by the short term moving average line having moved below the intermediate term line. On a closing basis we are now below the Sept low but not on an intra day basis. We have a little more to go to make that a new low. Trend: No confusion here, gold is below its short term moving average line and the line slope is to the down side. Strength: The short term momentum indicator remains in its negative zone below its negative trigger line. It is, however, attempting to bounce up above the line but has not quite made it yet. Volume: The daily volume action remains pessimistic. The highest volume during the week was on the Wednesday plunge while the lowest volume day was on the Friday up day. Not encouraging action. The short term rating on the Friday close can be nothing other than BEARISH. This is confirmed by the very short term moving average line moving below the short term line. As for the immediate direction of least resistance, I’m going with the up side just to be a little optimistic. 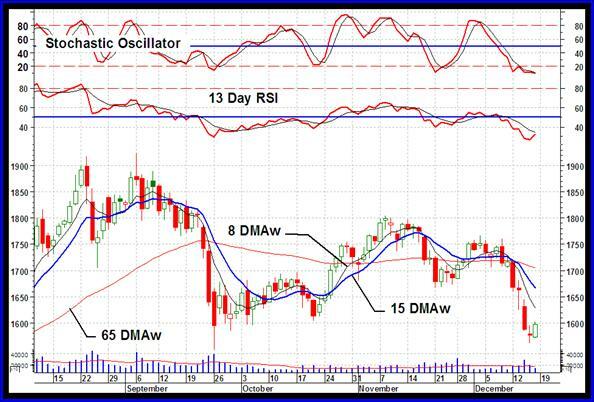 The Stochastic Oscillator is in its oversold zone and does look like it wants to reverse to the up side (but not yet). Friday’s price action just might be the start of a rally, or at least a short bounce. So, I’ll go with the up side. As with gold silver is now at new closing lows for this phase of its latest bear market but it has not quite made it into new intra day lows. That will take just a little more down moves. Trend: Silver closed the week below its negative sloping long term moving average line. Strength: The long term momentum indicator is in its negative zone and below a negative sloping trigger line. Volume: The volume indicator just touched a support level that it has reached a few times now over the past several months and is starting a possible bounce. In the mean time it is in a downward trend and below its negative sloping long term trigger line. The long term rating, at the Friday close, remains BEARISH. Trend: The week’s activities took the silver price further below its intermediate term moving average line and the line slope continues to point downward. Strength: The intermediate term momentum indicator remains in its negative zone below its negative sloping trigger line. There is some possible comfort in that the low this week in the momentum indicator has been slightly higher than its previous low during the Sept plunge. One might look at this as a gentle positive divergence. Volume: Despite a small perk-up at the end of the week the volume indicator remains below its negative sloping trigger line. The intermediate term rating, at the Friday close, remains BEARISH. This is confirmed by the short term moving average line moving even further below the intermediate term line. As with the gold price, silver has closed at a new closing low for this bear trend but not quite at a new intra-day low. That occurred during the Sept plunge. Trend: silver remains below its negative sloping short term moving average line. Strength: The short term momentum indicator remains in its negative zone below its negative sloping trigger line. Again, as with gold, the momentum indicator is making a positive divergence suggesting that a rally may be ahead. Volume: The daily volume remains very low and unfortunately, especially on the Thursday and Friday up days. The short term rating, at the Friday close, has moved back into the BEARISH camp. The very short term moving average line is confirming this bear. It’s Christmas time so here is wishing all a very Merry Christmas and a very Prosperous New Year. I’m taking a Holiday so there will be no postings during the Christmas or New Years week-ends. Well, that’s it for this week. Comments are always welcome and should be addressed to mervburak@gmail.com. For DAILY Uranium stock commentary and WEEKLY Uranium market update check out my new Technically Uranium with Merv blog at http://techuranium.blogspot.com. During the day Merv practices his engineering profession as a Consulting Aerospace Engineer. Once the sun goes down and night descends upon the earth Merv dons his other hat as a Chartered Market Technician (CMT) and tries to decipher what’s going on in the securities markets. As an underground surveyor in the gold mines of Canada’s Northwest Territories in his youth, Merv has a soft spot for the gold industry and has developed several Gold Indices reflecting different aspects of the industry. As a basically lazy individual Merv’s driving focus is to KEEP IT SIMPLE.